Recalling his 'unexpected drop out' from former prime minister Rajiv Gandhi's Cabinet following the 1984 elections, President Pranab Mukherjee has in the second volume of his autobiography ' The Turbulent Years 1980-1996' recalled that he was shell-shocked and flabbergasted, adding that he could not believe it. "When I learnt of my ouster from the Cabinet, I was shell-shocked and flabbergasted. I could not believe it. But I composed myself, and sat alongside my wife as she watched the swearing in ceremony on television," he writes. "As soon as it (swearing-in) concluded, I wrote to the Ministry of Urban Development asking to be allotted a smaller house in place of my 2 Jantar Mantar residence (which was a ministerial allocation), pointing out that I had ceased to be a minister - this was something I had done in 1977, too," he shares in his autobiography, which was unveiled at the Rashtrapati Bhawan here on Thursday. "The only time I met Rajiv between 1985 and 1988 was when I went to invite him for my daughter's wedding. 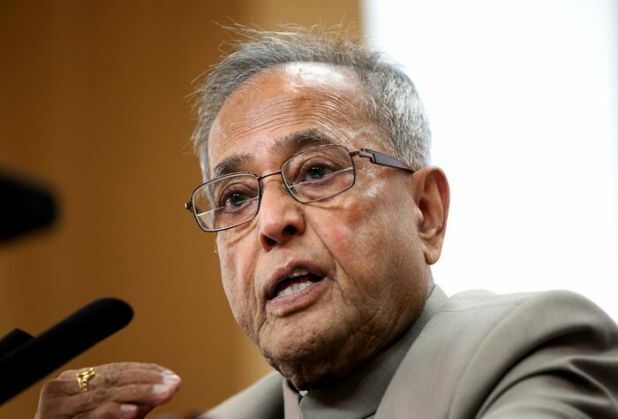 He did not come, but sent a cordial letter - my absence from the Cabinet resulted in a change in attitude towards me, even within the party," says President Mukherjee. He recalls, "In March 1985, Rajiv appointed me President of the West Bengal Pradesh Congress Community, which I saw as an opportunity and focused on the immediate task of contesting the elections to the Calcutta Corporation, which were being held after a long time, but the candidates' selection process was rife with factionalism." Accusing senior Congress leader Ashoke Sen, who was a sitting MP from Calcutta and made a Cabinet Minister in Rajiv Gandhi's government, of 'launching a bitter campaign' against him, President Mukherjee alleged that Sen accused him of supporting a group led by Subrata Mukherjee (now a member of Trinamool Congress and a senior minister in West Bengal). "But this allegation is not correct. In the process of selecting candidates I had consulted Ashoke Sen and all important leaders, including Priya Ranjan Dasmunsi, Somen Mitra, Mamata Banerjee and Ajit Panja. The intra-part squabbles saddened me but did not affect my work," he shares. "In the Lok Sabha elections, held soon after the assassination of Indira Gandhi in 1984, the Congress had done well, therefore, it was expected that the Congress would secure a majority in the Corporation elections, he says, however, when the results were declared the Congress lagged behind the CPI(M) by one seat. "My opponents, however, saw the Corporation defeat as an opportunity, and started demanding my resignation. Sen publically called for a change of command in the state Congress. Taking moral responsibility for the defeat, I declared that I would tender my resignation from the presidency of the PCC. I was asked by the Congress president to continue till a new president was appointed," he writes. President Mukherjee recalls, "In September 1985, Rajiv Gandhi expanded and reshuffled his Cabinet. Ghani Khan Choudhury, who had been dropped from the Cabinet along with me on December 31, 1984, was brought back as Minister for Programme Implementation. But I was not rehabilitated and, instead, was replaced by Priya Ranjan Dasmunsi as president of West Bengal PCC."